Maj. Gen. Victor J Braden is the 35th Infantry Division Commanding General. (Click Here for full Bio). Brig. Gen. John Rueger, Kansas, and Brig. 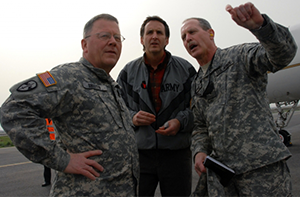 Gen. William Blaylock II, Missouri, serve as the Deputy Commanding Generals. 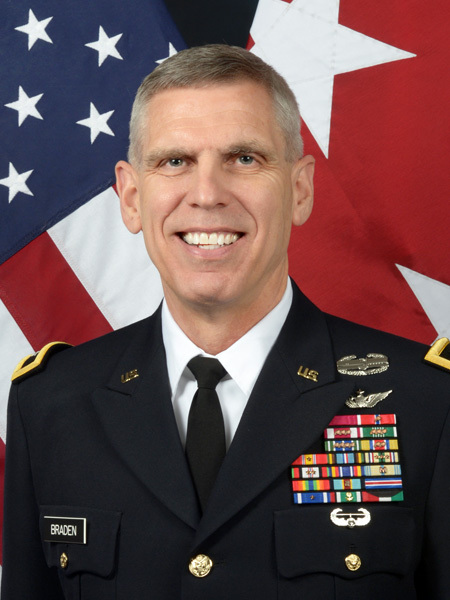 Col. Christopher Mickan serves as the Division Chief of Staff. The 35th Infantry Division is one of eight divisions in the Army National Guard. The 35th Infantry Division enjoys a training alignment with the 33rd Infantry Brigade, Illinois; 45th Infantry Brigade, Oklahoma; 48th Infantry Brigade, Georgia; 67th Battlefield Surveillance Brigade Nebraska; 142nd Fires Brigade, Arkansas; 35th Aviation Brigade, Missouri; 110th Maneuver Enhancement Brigade, Missouri; and 287th Sustainment Brigade, Kansas. The division was organized in August 1917 as a National Guard formation with troops from Kansas and Missouri, after a few months as the 14th Division. It consisted of the 69th Infantry Brigade (137th and 138th Infantry Regiments) and the 70th Infantry Brigade (139th and 140th Infantry Regiments). It went overseas in May 1918. Upon arrival in France, the 35th Division was garrisoned near the front in Alsace. It received limited training from the French Army. The Division saw combat in the Meuse-Argonne offensive where it collapsed after five days of fighting. During World War I, Battery D of the 129th Field Artillery Regiment had, as a battery commander, Captain Harry S. Truman, later President of the United States. The Division was activated on 23 December 1940, as a National Guard Division from Kansas, Missouri and Nebraska. The division departed for Europe on 12 May 1944. It arrived in the United Kingdom on 25 May 1944, and received further training. It landed on Omaha Beach, Normandy, 5–7 July 1944, and entered combat 11 July, fighting in the Normandy hedgerows, north of Saint-Lô. In 2001, the 35th Infantry Division headquarters, Fort Leavenworth, was notified that they would command the Stabilization Force (SFOR13) in Bosnia in 2003. They immediately began train-up for the mission, including terrain walks in Bosnia. More than 1000 soldiers of the 35th Infantry Division bid farewell to friends and family at Kansas State University on Jan 19, 2003. The unit was commanded by BG James R. “Ron” Mason, Asst. Division Commander from Kentucky. Sent to Bosnia, they replaced the 28th Infantry Division, Pennsylvania National Guard, as the lead unit of Task Force Eagle. At Eagle Base, Tuzla, Bosnia, the multinational force had the task of maintaining the peace and preventing further “ethic cleansing” which had plagued, and nearly destroyed, the area formerly known as Yugoslavia. On June 13, 2003 they began “Operation Tornado,” a ground and air assault using combat vehicles, aviation transport, and attack helicopters to secure an eight kilometer wide area near the town of Han Pijesak. During the mission, they uncovered a series of hidden bunkers and an enormous cache of weapons, ammunition, missiles, anti-tank weapons, and mines. They returned to Kansas in October, after completing their six month’s lead unit mission in Bosnia. They were replaced by the 34th Infantry Division of Minnesota and Iowa. Approximately 200 soldiers of the 35th Division, headquartered at Fort Leavenworth, deployed to Kosovo in the fall of 2007 as the headquarters unit for Task Force Falcon, a multinational peacekeeping force. The mission was also known as KFOR 9. Departure ceremonies were held at Harney Gymnasium at Fort Leavenworth on July 20, 2007 and they were then sent to Camp Atterbury, Indiana, for additional training before deploying to Kosovo for their year-long mission. Commanding the unit was BG John E. Davoren, Leavenworth, Assistant Division Commander (Maneuver). CSM Timothy Cochran served as Command Sergeant Major for this Multinational Task Force Falcon-East (MNTF-E).